CHICAGO (WLS) -- The backlog for tree trimming services across the city of Chicago is expected to be eliminated by the end of next year. That's partly because the Chicago budget will be adding the funding for 10 additional trimming crews. So far the city has reduced the backlog by about 50 percent. Mayor Rahm Emanuel says the progress is also due to a new work system for the crews. "Now tree trimming is on a grid model, so you're not doing a service request here and a service request on the other side of town," the mayor said. "You're on a grid model and it's more efficient. So each tree trimming crew is anywhere from 15 to 20 percent more efficient than they were before." 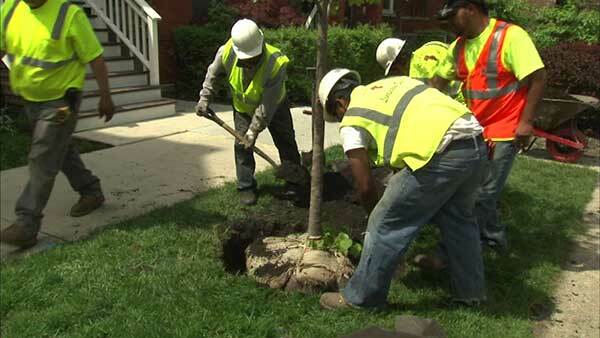 The mayor says regular tree trimming is one of the biggest requests made by Chicago residents.